Good morning and a very happy Wednesday to you all. You are saved from a lot of reading here today because life is, as always, pretty hectic. My 'to do' rail is heaving and I have two little apprentices here this morning to help but with Phoebe being 3 years and Louise only 20 months I'm not allowed to get them working on the machines as yet :-) .....it's a couple of hours of Nanny Annie time for me with lots of fun and giggles so I'm doing a quick 'show and tell' in pictures for you. This is my, now finished, Ark that Jo from Jozart bought for me to make for one of the twins. 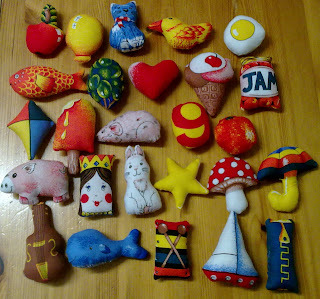 Thanks again Jo....I've loved putting this together and the little ones will have such fun with it [and their mummy]. It's now filled with all the little animals too. 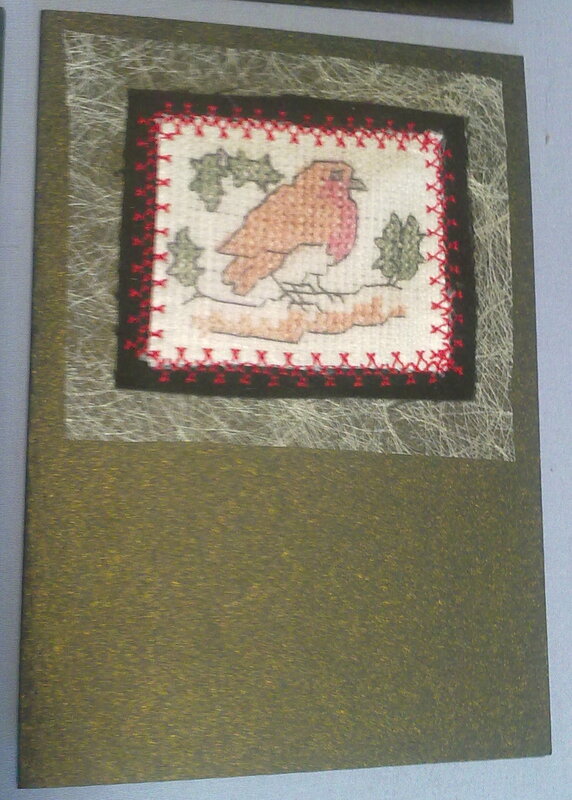 This is the first 12 Christmas cards I've made with a close up of one of them for you. Here is the next 12. 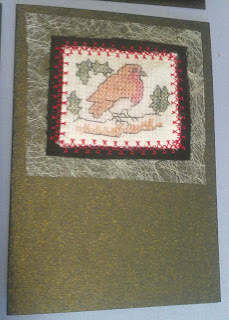 Another set made using a scanned x-stitch done by one of my daughter's many years ago.A bit of machine embroidery and a layering up of fabrics and ta da! And a close up of one of them for you. There you go. Hope you enjoyed the quick peep at my desks today. My 'to do' rail is calling.....I must do some of it before my little Granddaughters arrive so I will try to pop round to do my WOYWW visits later. Have a great week and stay creative. When you say pretty hectic, you mean pretty hectic! You've been keeping very busy with all your beautiful makes. Have the most wonderful day with your lovelies!! I am very impressed with the neatness of your work with the little ABC items. Goodness, but you must have had to be careful with all the snipping of curved seams and turning. That's the bit I hate doing with my padded hearts - and they're big compared to the size of yours! You must be very patient!! gosh your always busy hunni.nice to have time with grand kiddes today.Absolutely love the noahs ark what fab idea ,and plenty of hours of fun im sure. Wow!! I love those ABC items... so clever. In fact I love everything... have a great day with the little'uns!! Hi there. Thanks for letting us peek into your creative space this week. It's always inspiring seeing where and how we create! Hope the rest of your week goes very well for you. Enjoy family time, it is precious indeed. 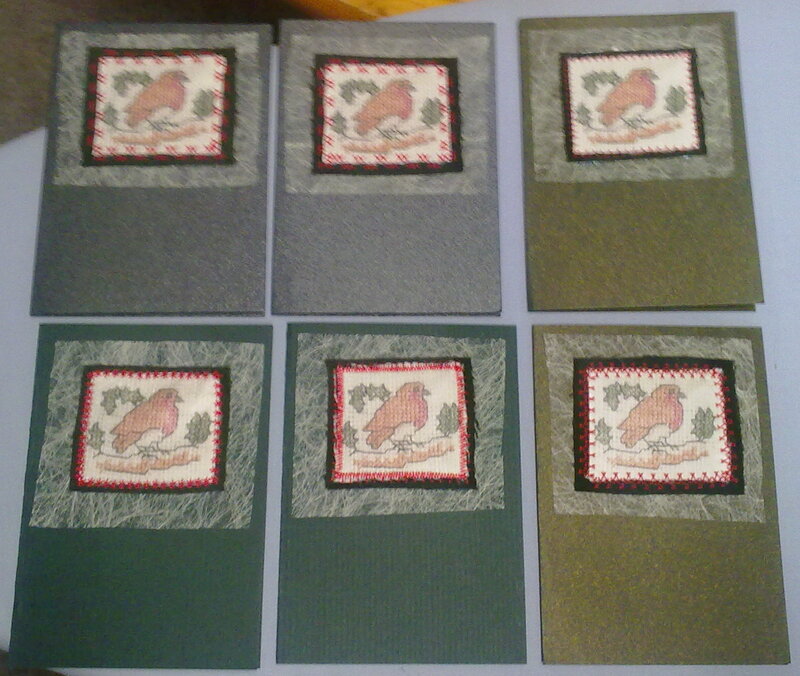 Lovely cards there too. Have a wonderful time with your grandees. Lucky you! Great cards an the Ark is amazing. You've made such a lovely job of it. 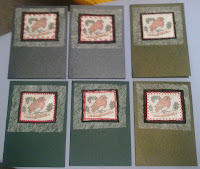 Such gorgeous creations and you have made cards as well. Love the pics of your beautiful grandchildren. 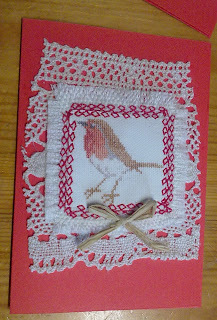 I love the Christmas card design Annie, especially the beautiful lace you’ve used. 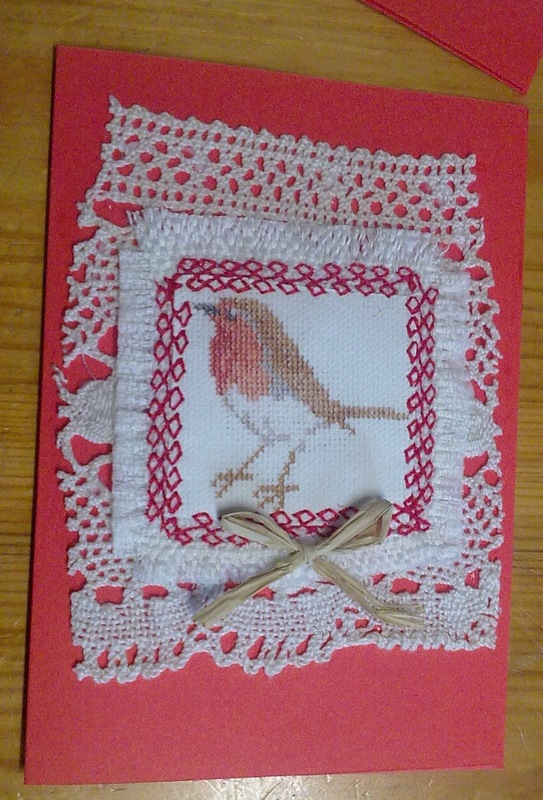 And what a great idea to photocopy the cross stitched panel, I would never have thought to do that……..mind you, I have to say……….I’m a little disappointed. 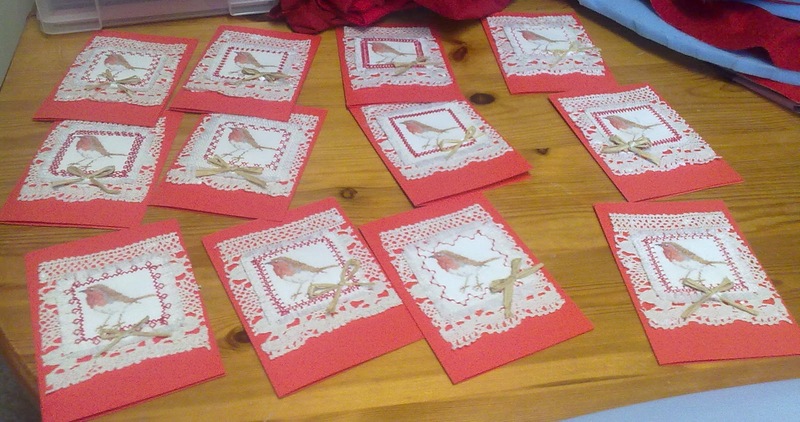 There was me sitting here thinking that you had stitched all those little Robins yourself Annie, Lol! Hope you’re having a fun day with your family. these are fantastic! I adore the ark! have fun with your wee helpers! The ark looks wonderful. Pat on the back to you. 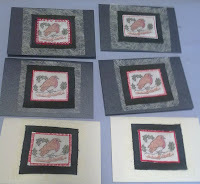 The cards are sweet and even sweeter that you have incorporated something that your children made when smaller. Have frun with your two little poppets. Hugs Mrs A.
Lovely ark. Kids will love that I'm sure. Beautiful cards. Have fun with the Licklies! That Ark is gorgeous. What is wrong with Slave/Child Labour anyway? LOL! ah have fun with those Grandchildren! 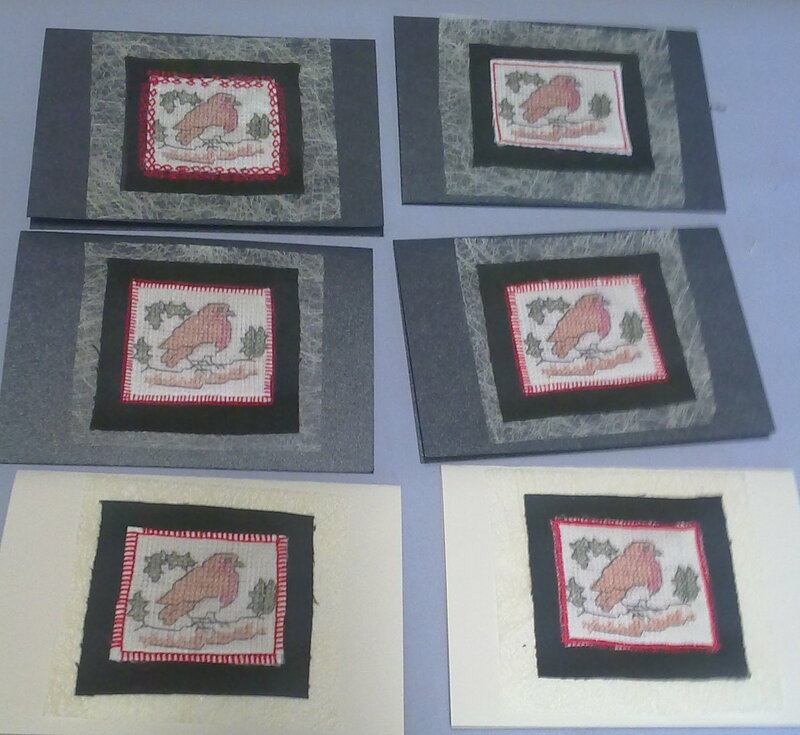 Love your Ark and those Christmas cards are just beautiful! Oooh that ark is the bees knees and you made all the bits for inside too? Now I know you have the patience of a saint and the skills to match!! Love the C cards... they are beautiful. Love the cards!! Great idea!! A is for Ark and Amazing as well as ABC - all beautiful. Just noticed the photo of your Grand-daughter in previous post (and in a bath) gave me a big smile. I think we are all getting that hectic feeling creeping in now, Annie. You've been so busy though. I love Jo's ark. Enjoy your Granny time with your little treasures. I don't know about a to do rail, it's a to do life there... the ark is fab and such great colours and the robin is so festive and sweet. Hope you can find cruise control ! Thanks for taking some time to share your desk...Sarah at 14. Sounds like you've had a Fun Day Monday and a Fun Day Wednesday this week! 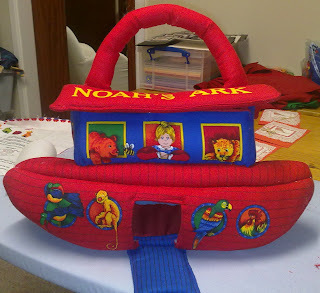 Love all your makes, but the Noah's Ark is just superb! Oh the ark is just wonderful! The twinnies will get hours of pleasure from it, well done you and JO!